In a medical setting, surgery is the most common cause of major blood loss, defined as a loss of 20% of total blood volume or more. In particular, cardiovascular procedures, liver transplantation and hepatic resections, and major orthopedic procedures including hip and knee replacement and spine surgery, are associated with severe bleeding. Excessive blood loss may also occur for other reasons, such as trauma. Indeed, bleeding contributes to approximately 30% of traumarelated deaths. Bleeding in critical locations, such as an intracerebral hemorrhage, may also pose a major clinical challenge. Severe bleeding often requires blood transfusion. Even when the benefits of transfusion outweigh the risks (e.g., mismatched transfusion, allergic reactions, transmission of infections, and acute lung injury), strategies to minimize the use of limited resources such as blood products are essential. The most obvious and probably the most effective strategy is to improve surgical and anesthetic techniques. For example, liver transplantation, a procedure that once required transfusion of large amounts of blood products, now has relatively small transfusion requirements in most instances. Ruling out abnormalities of hemostasis in a patient with bleeding is also essential, because such problems can often be corrected by replacing the defective components of the hemostatic system. 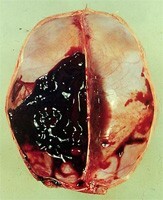 However, cases of excessive blood loss in which no surgical cause or abnormalities in hemostasis can be identified require pharmacologic strategies, which can be broadly divided into preoperative prophylaxis for operations that confer a high risk of bleeding and interventions for massive, refractory bleeding. The medications that have been most extensively evaluated as hemostatic agents include the antifibrinolytic lysine analogues aminocaproic acid and tranexamic acid; aprotinin, a bovine-derived protease inhibitor; and desmopressin, a synthetic analogue of the antidiuretic hormone that raises the plasma levels of factor VIII and von Willebrand factor. In addition, recombinant activated factor VII appears to be efficacious in an array of clinical situations associated with severe hemorrhage.4 The safety of aprotinin, the most widely used of these agents, has been questioned because of concerns about renal and cardiovascular adverse events.